After “The Trade”, How Good is the Bills Receiving Corp? Sammy Watkins was the fourth overall selection in the 2014 NFL Draft and as such was expected to become a legitimate number one receiver. When healthy he played well, catching 65 passes for 982 yards as a rookie and 60 passes for over 1000 yards in his second year. He totaled 15 touchdowns in those two years. In 2016, he missed a lot of time due to injuries and his production fell off to only 28 receptions for 430 yards and two touchdowns. While Sammy was a very good player for the Bills, I don’t and have not seen him as a number one. In my book he is more of a two but a very good two. With Watkins and Robert Woods gone, how strong can the Bills receiver corps possibly be? It is not going to be as weak as many around the league feel. Let’s start with recent free agent signing Aquan Boldin. Boldin may be 36 years old and a 15 year vet but he still has something in the tank because of the way he takes care of himself. He is obviously on the back nine of his career, maybe even teeing off on the 18th hole but his leadership and know-how will help the Bills for this year. He is reliable and he doesn’t get hurt. Last year he caught 67 passes for 584 yards and eight touchdowns. He is a future Hall of Famer and his role will not only be to produce but to show the young guys ow to be a pro. I have always liked Jordan Matthews, going back to his senior year at Vanderbilt. He is big, fast, tough and productive. He was a high second round pick by the Eagles in that receiver strong 2014 Draft class. Looking at the numbers, he has more production than Watkins. In three years he has 225 receptions and 19 touchdowns. As a rookie in Chip Kelly’s offense, he caught 67 passes and looked as if he was going to have a bright future. He followed that up with an 85 catch year in 2015 along with eight touchdowns. Going into camp a year ago he was the Eagles number one receiver but his play fell off because of eight dropped passes, many in key situations. While he still had 73 receptions, the drops left a sour taste in the Philly coach’s mouths. A change of scenery may be just what is needed to get him back to where he was two years ago. Matthews sternum injury Sunday will slow him up some during the preseason, but he should be full go when the regular season gets going in a month. Matthews and Boldin will give the Bill a better starting duo than many clubs in the league have. The third receiver will most likely be rookie Zay Jones, who is one of the most productive pass catchers in college football history. While Jones timed fast at the Combine (4.45) he doesn’t look like he plays that fast. Part of the reason is he’s a “strider.” Striders never look as fast as they really are. Jones was easily the best receiver at the Senior Bowl and once he learns the nuances of an NFL offense he will become a very good pro. 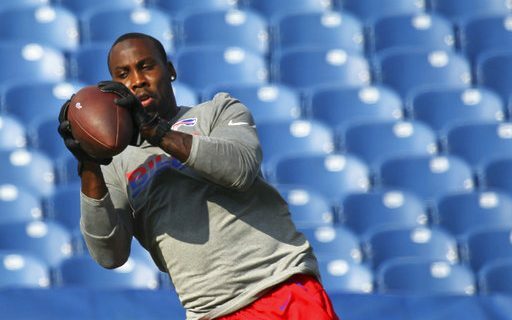 Boldin could help speed up his learning curve. After those top three, there will be a competition the remainder of camp. Many clubs keep six receivers on the 53 man roster and numbers four through six have to be productive special teams plays. Andre Holmes, the six-foot-four wideout the Bills signed as a free agent from the Oakland Raiders, fits that mold. He has made a career for himself as a special teams player and figures to be one of the six. The remaining two receivers will come from the camp roster. All have talent but they have to show they can play on teams as well as being reliable when asked to play from scrimmage. That will sort itself out over the next three weeks. Looking at the top four receivers the Bills are in good shape. The overall depth is probably not as strong as many other clubs so it is obvious that Boldin, Matthews, Jones and Holmes have to stay healthy.